Okay it's on the calender for every second Saturday of the month through May. 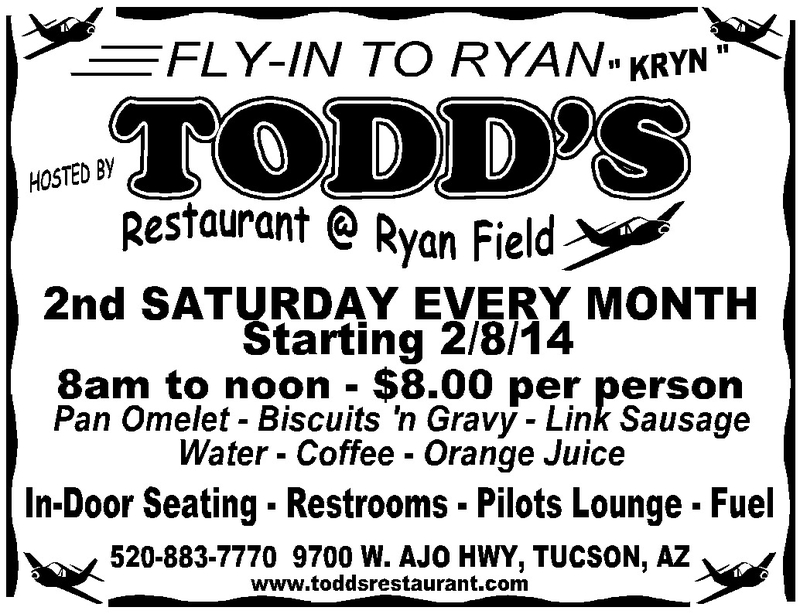 We at Ryan Airfield in Tucson, Arizona would like to invite everyone to our Fly-In breakfast at Ryan Airfield (KRYN) in Tucson every 2nd Saturday of the month starting Feb. 8, 2014. Come and join other LSA and other GA aircraft and maybe a couple of old military. It will start at 0800 and end at 1200 hrs. on Feb. 8th. and then re-occur every second Saturday of the month. It will be indoors, bathroom facilities and catered by our own Todd's Restaurant. Menu is pan omelet, link sausage and biscuits and gravy, coffee, juice and water. This will be the second Saturday through May. Hope to see you there. If you have any questions you can call me. I'm renting the Skycatcher at Falcon and I'll be there around 10. I'd very much like to meet you Mr. Lee and Mr. Nelson. I'll head for the restaurant after landing. I'll be there. I'll look for you. Sorry I didn't make it. It took a bit longer getting started on an unfamiliar plane. Then the GPS started giving me fits. I stayed close to FFZ. There's always next month. For the first event, the turnout was good... about 150 breakfasts served! You guys are breaking my heart, Tim. I'm under a foot of snow here. Breakfast Fly-In again at Ryan Airfield this Saturday march 8th. 0800-1100 hrs. roger lee wrote: Breakfast Fly-In again at Ryan Airfield this Saturday march 8th. 0800-1100 hrs. Light breezes and 72-80 degrees forecast for the Tucson/KRYN Breakfast Fly-in this Saturday (April 12)... 8-11am. See you there? Is this thing still going on?